Not all watches are the same, but before the world goes absolutely crazy over smartwatches, the traditional timepiece still has a place in the overall hierarchy of things. Casio’s G-SHOCK range has been a favorite for many over the years, and it looks that this range of tough watches is about to get yet another new addition to the family. The latest G-LIDE collection will place an emphasis on superior functionality and performance, where it will come in a quartet of eye-catching colors which emphasize G-SHOCK’s distinct digital time-telling and surf data capabilities. Specially designed with surfers and water sport enthusiasts in mind, the latest range of G-SHOCK G-LIDE watches is made up of the GLX5600 (C-1 / C-2) and the GWX8900 (C-3 / D-2). The GLX5600 edition will boast of 200M water and shock resistant technology, a trio of multi-function alarms and snooze function with flash alert, a countdown timer, 1/100 sec. stopwatch, World Time of 29 time zones (48 international cities) and operates in a 12 or 24 hr format. The full functions of the GLX5600 will be complemented by the highly coveted Tide & Moon graphs and Moon Age data chart which clearly anchors the face of the timepiece, hence enabling the most precise tide and surf swell recordings. In addition, there is the auto EL backlight on the GLX5600 models that deliver easy reading of the digital time-telling graphics. As for the GLX5600C-1, it will come shielded by a black translucent resin case as well as band with contrasting neon green detailing, whereas the GLX5600C-2 will feature a blue translucent resin case and band with neon pink detailing. Regardless of which particular option you pick, both are guaranteed to provide undeniable style to the world’s top surfers and action sport enthusiasts who love nothing better than to spend time in the waves. 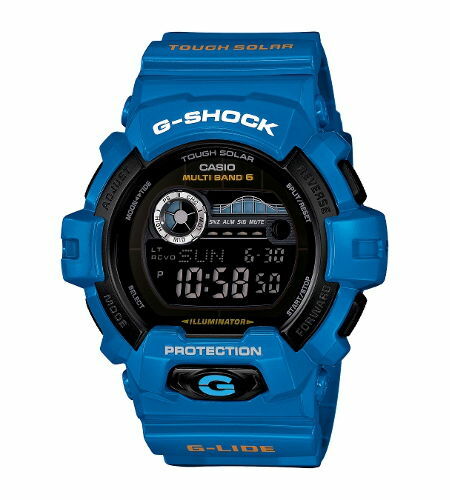 As for the GWX8900 models, they too would feature standard G-Shock features, apart from boasting tough solar power, Multi-Band 6 Atomic Timekeeping, and dual countdown interval timers, 4 daily alarms with 1 snooze, full auto super illuminator LED backlighting capability, and preset and user set sites which would make the GWX8900 models an excellent addition to the G-LIDE summer series, with users being able to choose from fluorescent green (GWX8900C-3) and royal blue (GWX8900D-2) shades. The G-LIDE GLX5600 (C-1 / C-2) and the GWX8900 (C-3 / D-2) will cost $99 and $150, respectively.